Let me introduce you to a visitor that arrived in the mail just after Halloween. This is Flat Stanley, he was smashed flat by a bulletin board. His dad had hung the bulletin board on the wall above his bed. It fell off the wall while he was asleep and smashed him flat as a pancake. Being flat as a pancake has some unique privileges, as a consequence, Stanley can travel by mail. He is visiting from Texas, and he goes to 1st grade with my niece. We are going to use the blog to keep track of his adventures and experiences, keeping his first grade class updated on what he is up to. So you will see him on various posts throughout the next few months. Flat Stanley will be visiting until March. Stanley arrived on a busy week. We were cleaning up, repairing and fixing all kinds of stuff around the house. The first thing we did was go out and play in the leaves. It's getting ready for winter and all the leaves fall off the trees. They are crunchy and it's fun to run through them. they are light and fluffy and they blow everywhere. of leaves all over the ground. Even Oscar dog likes to play in the leaves. We hide his toy in the middle of the pile and he makes a big mess trying to find it. It's really fun to play with Oscar. 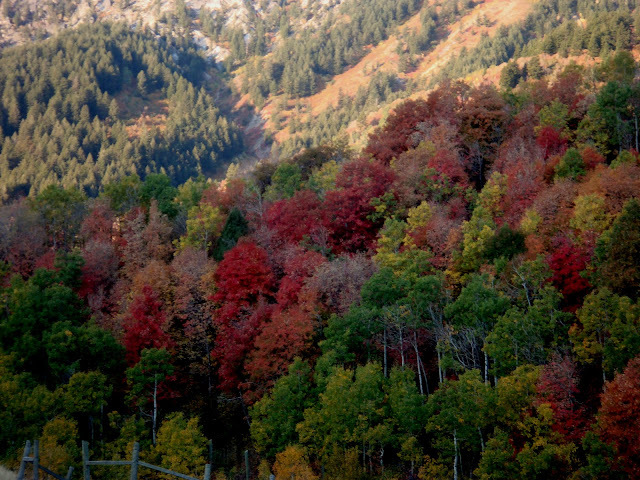 But the leaves turn all different colors of red, yellow, orange, green, and orange/red. It's really pretty and when the sun shines on the trees in the morning the leaves are even more bright and colorful. then they fall off the trees leaving them bare. but it has been raining and kind of warm & cloudy this entire week. when you breathe you can see your breath in the air like big puffs of white steam. They were doing construction on the water pipes on the street that goes to Aunt Nettie's house. we had to go around the block. It was a mess! there was barely enough room to turn down the other street. I'm not sure if it was the road construction or something else, but on my day off I got to fixing and getting all kinds of projects done around the house. Long over-due projects. . . first on the list were the blinds. The blinds broke, so I couldn't get them open. They were stuck. a zip-tie solved our problem, almost. they only work one way, but at least I can open them and then close them again. This is our lawn mower. I purchased it when we moved in to this house. It's old and breaks down frequently. Once again it died, right in the middle of a mow. There was a strip going all the way around the back yard and one going through the center. It looked pretty ridiculous. But this is not the worst it's been. The genius mowed once and put stripes down through the front yard. . .
. . . then the mower died and it looked like this for almost two weeks. My neighbor's mowing crew asked if I needed help!!!! By the time I got the mower back we almost needed a swather. The grass was so long it was almost taller than Oscar dog. It almost filled two dumpsters by the time we were done, typically we fill one. I picked the last of the strawberries for the season. So far strawberries are about the only thing I have been able to grow successfully. I also got digging into the cupboard and found all these bags of popcorn! I rounded up all the bags of popcorn, combined them into a single container, plus an extra bag. That's a lot of popcorn! My kids will probably still have popcorn to get rid of when I leave this existence. For a treat, I made a batch and decided to rest for a minute. Yum! Actually I was avoiding the next project. . . Probably the most disgusting thing to fix in a house is a clogged drain. and how do I collect so much stuff???? First I cleaned out the cupboard under the sink, which was not nearly as fun or as rewarding as my popcorn project! There's a reason plumbers get paid to come to our houses to fix gross stuff like this. While this is not a difficult task, it's extremely GROSS! This thing has been growing for at least 2-3 years. But the sink now drains when we brush our teeth and wash our hands. That's a good thing. And finally, the last project of the day. kind of a sad day, it's time to hook the bike up to the trainer. Winter is officially coming and my riding outside days are over for a while. While this looks more like a mad science project, it keeps me going through the winter. I'm already looking forward to spring! winter arrived in a bluster!